Many Tennesseans don't realize scorpions are lingering in their neighborhoods under rocks and lawn, garden and forest litter. Two kinds of scorpion live in Tennessee: the plain eastern stripeless scorpion and the striped scorpion. Scorpions are not insects; they are actually in the same class as spiders. The three parts of a scorpion are the cephalothorax (head), the segmented abdomen and the telson (tail). The tail is the weapon of the scorpion and shoots venom into its prey or to defend against predators. The venom of scorpions found in Tennessee is no stronger than that of a honey bee. Scorpions lay their eggs in cracks in rocks. Scorpions are nocturnal creatures. They feed at night and hide during the daytime. Their favorite temperature is around 77 degrees F. During the winter, scorpions become sluggish due to the cold temperatures. Scorpions are cold-blooded creatures like reptiles. They are most active in the summer when it is warmer and greater quantities of food are available. The diet of the scorpion consists of crickets, ants, spiders, butterflies, mealworms and other invertebrates. The plain eastern stripeless s+corpion is reddish in color with a hue of dusty-brown. What distinguishes this scorpion from others is it is missing a tooth near its stinger. This species of scorpion is not a transplant; the species evolved naturally in Tennessee and other southern states. The plain eastern stripeless scorpion likes humidity and lives in the forest where there is a continuous supply of moisture from forest litter, rotten wood and dead bark. Male and female scorpions come together to mate only. 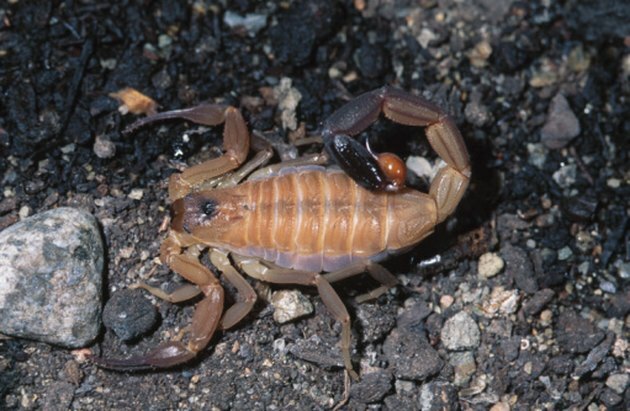 A female plain eastern stripeless scorpion litter can contain up to 40 newborn scorpions. The striped scorpion is yellowish brown in color with two stripes running the length of its back from its head to the tubercle on the tail. The tubercle is a tooth near the base of the stinger on the scorpion's tail. The lifespan of this scorpion is only around two years. The striped scorpion at full maturity is no more than 3 inches long. After mating, the female scorpion can produce 50 or more newborn scorpions. The striped scorpion travels in clusters and lives under rocks and in crevices. Scorpions lay eggs like reptiles. Viviparous means that after fertilization, the egg of the scorpion grows inside the female and baby scorpions are born alive. Baby scorpions are white in color and look like miniature adults. 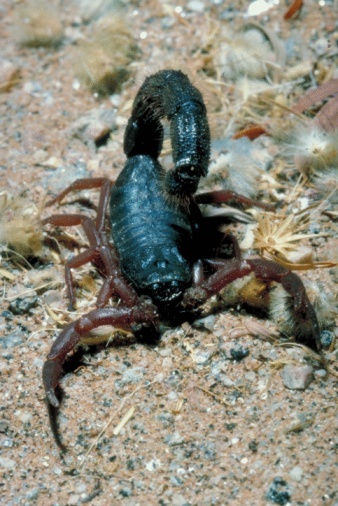 After the birth of her babies, the female scorpion allows them to climb onto her back, and that is where they live for the first week of their life. After seven days the baby scorpions become fully independent. 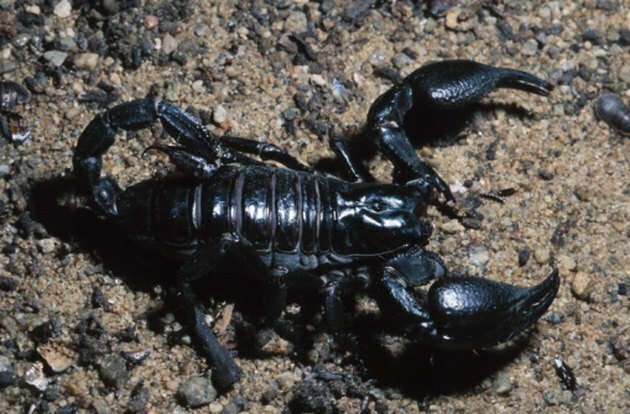 Full maturity for the plain eastern stripeless scorpion is three years and for the striped scorpion one year. Molting occurs at maturity. A male scorpion is distinguishable from a female because it is about an inch shorter and thinner than the female. Tammy Bronson has been a freelance writer since 1994. As a writer for Thompson Gale Publishing she wrote autobiographies and legal reviews. With Remilon.com Bronson wrote innovative informative articles about colleges and universities nationwide. She lives in the Greater Boston Area and has a Master of Arts degree in literature and writing from the State University of New York.